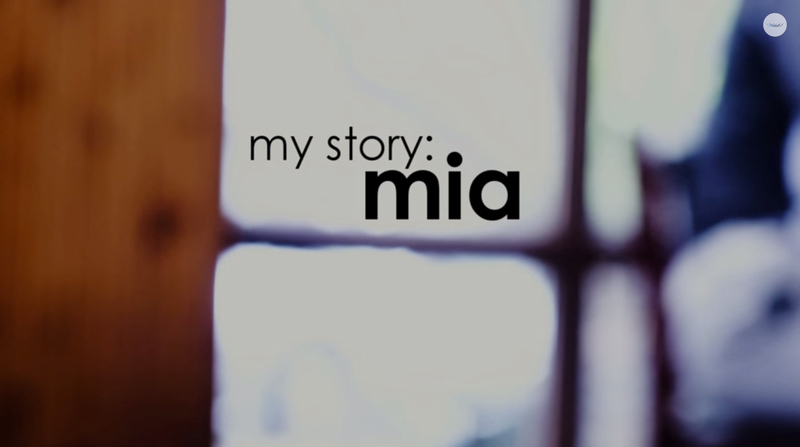 Our ethos: A healthy beautiful smile with minimal preparation. We believe in conservative aesthetic dental treatments; the teeth remain healthy and functional whilst being beautifully transformed. Our aim is for you to smile with confidence. Dr. Enright prides herself in using the state of the art materials, she also routinely takes before-and-after photos of her work. All the work presented on this website has been carried out by Dr. Enright. We are highly skilled in providing smile makeovers. A smile makeover involves the transformation of the teeth by the utilisation of crowns and veneers. A comprehensive examination and xrays are required prior to this treatment. Dr. Enright will make a mock-up of your new teeth so you can see the results before the treatment is started. A smile makeover will take two appointments from the preparation to the fitting of your new smile. Please see our before and after gallery. The discreet way to straighten your teeth in 6 months. Please enquire within by calling us on 01 495 2523 or by filling out our online Enquiry Form. Clear aligners are a discreet, modern alternative to ‘train tracks’. For adults who have minor misalignments who do not wish to wear train tracks for an extended period of time. 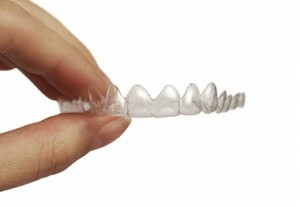 A series of clear plastic aligners can treat minor crowding / malalignments. For examples of clear aligner treatments, see our before and after gallery. Badly broken down teeth can be built up with the latest aesthetic composite materials. 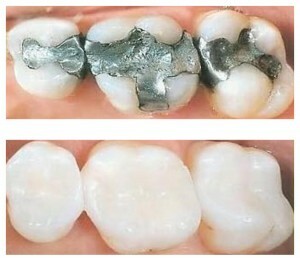 Patients who wish to replace unsightly old silver (amalgam) fillings may avail of this service. 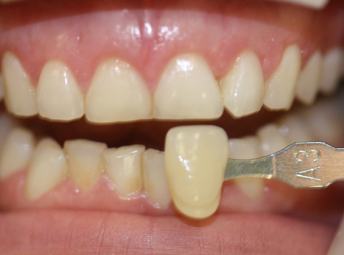 These fillings can give a truly aesthetic result with an artistic flair. Different colours of composite can be used to match your teeth. Both front and back teeth may be restored this way. The aesthetic composite used actually has particles of porcelain in it which gives a truly aesthetic and long-lasting restoration. After a course of home bleaching. The teeth are brighter now. Bleaching is used to improve the appearance of discoloured teeth. Special trays are made to fit over the teeth. Into these trays a bleach material is placed and then the trays are worn over the teeth for two weeks. The teeth usually dramatically lighten in colour by several shades. There are also several techniques to lighten teeth that have become dark due to root fillings. A veneer is a thin porcelain shell which can be placed over prepared teeth. Dr. Enright carries out conservative preparations of your teeth, the veneer is generally the thickness of a finger-nail/contact lens. Veneers are extremely strong and durable and can give a highly aesthetic result! Generally they are recommended for stained, discoloured teeth, overcrowding and misshapen teeth. 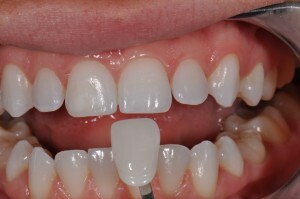 Please see our before and after gallery to see the results which can be achieved with veneers. We provide the replacement of silver fillings and the restoration of teeth with white cosmetic fillings. Please browse our before-and-after gallery for a true depiction of Dr. Enrights work. Dr. Enright routinely photographs her work, this can also help in educating the patient. During the filling procedures, Dr. Enright routinely uses a Rubber Dam, this is a sheet of latex which stretches over the teeth. Many patients prefer this, as it keeps water and the suction out of the patients mouth. Fillings carried out this way are more predictable. If you are nervous, you are more than welcome to bring your iPod along to your appointment, to listen to your favourite music. This simple procedure generally does not involve Local Anaesthetic. It can be carried out in 1 appointment to change the shape, alignment and colour of teeth using an aesthetic tooth coloured material. 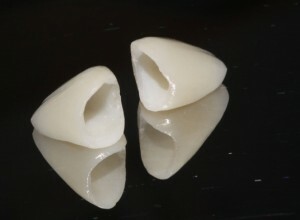 An inlay is an alternative to a conventional white filling. 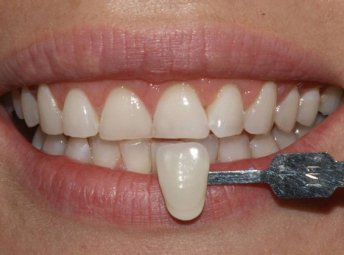 Inlays can be made of porcelain/composite which results in a strong, beautifully functional restoration. Research has shown that inlays can restore the tooth back to its natural strength. Unlike fillings, inlays are chemically bonded in place which gives a truly long lasting, durable restoration. Teeth adjacent to a space/gap can be replaced by the crowning of the adjacent teeth to which an artificial tooth is bonded. These are long lasting, durable restorations. Minimal preparation of the teeth may be carried out (Adhesive bridge.) Please enquire. A crown is a shell of porcelain/ceramic which is placed over your tooth. Crowns need to placed over teeth which may need to be reduced in size. This is a procedure which is carried out if fillings are broken, fractured, or over root treated teeth. Please see our before and after gallery.